A parliamentary report of 1777 listed parish workhouses in operation at Shepton Mallet (for up to 140 inmates), Ditcheat (33), Lamyatt (12), and Pilton (30). A workhouse and gaol existed on Boards Lane at Croscombe in the eighteenth century. County of Somerset: Ashwick, Babington, Batcombe, Binegar, East Cranmore, West Cranmore, Croscombe, Ditcheat (2), Doulting, Downhead, Emborough, Evercreech (2), Holcombe, Hornblotton, Lamyat, East Lydford, West Lydford, Milton Clevedon, East Pennard, Pilton (2), Pylie, Shepton Mallet (4), Stoke Lane or Stoke St Michael, Stratton-on-the-Fosse, Upton Noble. The population falling within the Union at the 1831 census had been 18,040 with parishes ranging in size from from East Cranmore (population 64) to Shepton Mallet itself (5,330). The average annual poor-rate expenditure for the period 1833-35 had been £11,765 or 13s.0½d. per head of the population. 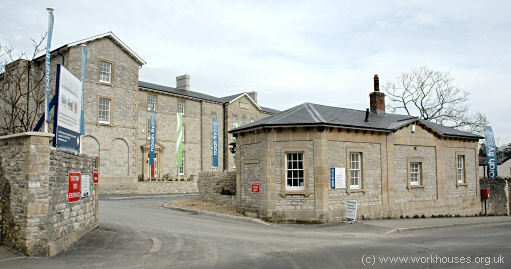 Shepton Mallet Union workhouse was established in 1836 when the Poor Law Commissioners authorised an expenditure of £2,250 for alteration of an existing building. The 1839 Commissioners report indicates that an "old" workhouse was in operation at this time. Confusingly, the Guardians' minutes and dated plans for this period seem to indicate the erection, in 1836, of a new building designed by Jesse Gane. 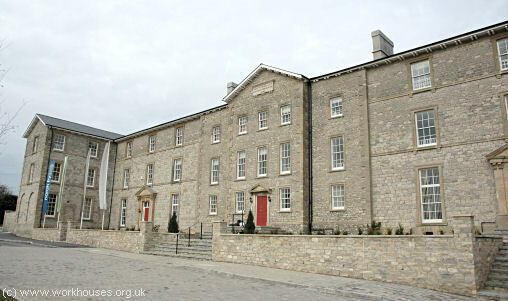 Gane was also the architect of the Clutton Union workhouse built in 1836-7. 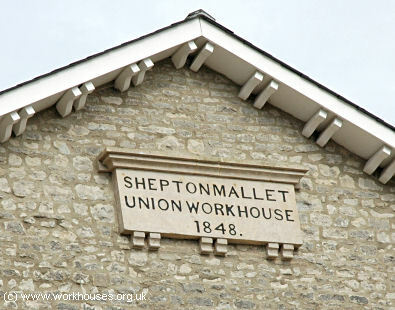 The new workhouse, whose front block bears the inscription "Shepton Mallet Union Workhouse 1848", was erected at a site to the west of Shepton Mallet. Its cruciform layout, which is very typical of other workhouses of the 1830s, is shown on the 1903 map below. Shepton Mallet general view from the south-east, c.1905. The front range of the workhouse faced onto the road at the south. A lodge stood at the entrance to the site. Shepton Mallet general view from the south, 2006. The western end of the front block had the chapel and the Master's office on the ground floor, with the women's infirmary above. The eastern end contained the board room, waiting room, and clerk's office, with the male infirmary above. The projecting wings at each end housed vagrant and probationary wards. Shepton Mallet entrance and lodge from the south-west, 2006. Shepton Mallet from the south-east, 2006. Shepton Mallet date plaque, 2006. To the rear, four three-storey ranges radiated from an octagonal hub. The hub contained the kitchens, and the dining hall was on the ground floor of the north range. The upper floors of the hub contained the Master's accommodation. The other wings contained dayrooms, dormitories, school-rooms and so on. Shepton Mallet from the west, 2006. A separate infectious diseases hospital was erected at the north east of the workhouse some time in the late nineteenth century. 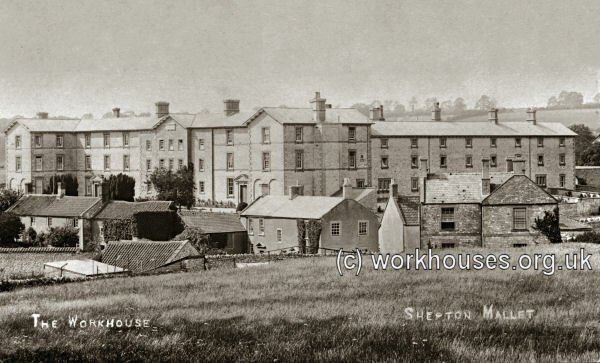 From 1904, to protect them from disadvantage in later life, the birth certificates for those born in the workhouse gave its address just as Wst End House, West Shepton. In 1930, control of the workhouse site passed to Somerset County Council. The following year, the buildings were converted for use as a home for female "mental defectives". The home later became the Norah Fry Hospital but closed in around 1990. After standing empty for many years, the buildings were refurbished for residential use in 2005-6. Somerset Heritage Centre, Brunel Way, Langford Mead, Norton Fitzwarren, Taunton TA2 6SF. Holdings include: Guardians' minute books (1836-1930); Admissions and discharges (1853-1930, with gaps); Births (1866-1926); Deaths (1866-1930); Baptisms (1874-1929); Creed register (1888-1930 with gaps); Offences and punishment book (1887-1924); Register of mechanical restraint (1895-1929); etc.